Even in a country as full of art as Italy, Florence (or Firenze, by its Italian name) stands out from the crowd. The city was one of the wealthiest centers of commerce and political power during the Renaissance. This history of power and wealth has left the city a legacy of beautiful architecture and great art creating an inordinate number of things that are worth seeing. We spent 5 days in Florence in May 2003. I was told that it will be more than enough (same thing happened for Venice). But it wasn't, because there's so much to see in Florence. I didn't get to see the Bargello and Palazzo Pitti, and I've only spent half a day at Uffizi, which I felt was not enough. If you don't care about art then you'll probably be able to spend only one day in Florence and feel that you've seen everything. But if you don't care about art, then why come to Florence in the first place? No, wait, I changed my mind. 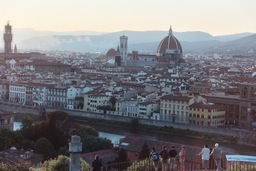 Come to Florence for one day. I'm pretty sure you'll want to come back and spend more time here :-) And on a second thought, you could come to Florence for the food, which was the best we had in Italy. But no matter how much time you'll spend here, you can't say you've been to Florence unless you see two things: The Piazza del Duomo with the beautiful Duomo, Campanile and Battistero and the statue of David by Michelangelo (the one in the Galleria dell Accademia). In Florence you don't have to seek out the art. Just walk around and you'll most likely end up in a beautiful piazza full of sculptures and beautiful buildings. The best way to see the city is to walk everywhere. The center of the city is small and compact and because of that when the sun sets, Florence can give you an intimate feeling that a big city like Rome can't.